The Chinese have a saying: "All things change, and we change with them." Once known as a bastion of unbridled capitalism, Hong Kong is changing. The sudden resignation in March of former Chief Executive Tung Chee-hwa and the appointment of his successor, bow-tied bureaucrat Donald Tsang, are not only signs of Beijing's authority over the territory. They are also indicators of how "people power" has shifted political currents in this former British colony. Hong Kong is fast becoming synonymous with a struggle for democracy on the threshold of mainland China. For many in the territory, the embodiment of the times is not some high-rise tycoon, but a Che Guevara-clad, democratic revolutionary living in a public housing estate. Leung Kwok-hung, popularly known as "Long Hair" or "Cheung Mo" in Cantonese, is that person. The 48 year-old legislator tops popularity polls and has a play, a film and even a doll all dedicated to him. A long-time symbol in Hong Kong for issues of social justice, Leung's victory in last September's restricted Legislative Council (Legco) elections surprised most. Few could have predicted that this high school dropout would ever make it beyond the barricades outside the Legco building to become an Honorable Member inside. However, as Hong Kong delegate to the Beijing's National People's Congress Allen Lee says, "Long Hair is clever." Indeed, there is more to him than meets the eye. "Long live democracy! Power to the people! Elect the Chief Executive by universal suffrage!" It was a moment of high drama in the usually staid legislature, one that caught the attention of the world and shook the dust off more than a few lapels in Beijing. It also caught the eye of New York Times editorial board member, Eleanor Randolph, who compared him to filmmaker Michael Moore for his dramatic flair and casual image. She wrote, "The real concern is how the mainland sees Leung's protests. His statements touch on raw truths, the combustible stuff that most people are afraid to say too loudly, especially in an official chamber." One of his first "combustible" achievements was to challenge the formal dress code of the legislature to win the right of serving his term in a T-shirt. The times have been a-changing in Hong Kong and many see Leung's ascent as a sign of this change. Life as a career activist has earned him his critics, however. He has been accused of manipulating the media and of suddenly turning up the activity whenever a camera is around. Following his election victory, Hong Kong's major English language newspaper, The South China Morning Post (SCMP) wrote, "Mr. Leung's relentless theatrics have become tiresome, boring and embarrassing." They also suggested that he "must pick his battles carefully...work within the system and play by Legco's rules." Since last fall he has tried to push forward a democratic agenda by proposing a referendum on universal suffrage as well as initiating a controversial minute of silence in the Legislature in remembrance of deceased former Chinese Premier and reformer, Zhao Ziyang. The entire pro-democracy caucus also joined in, provoking the opposition members to boycott rest of the proceedings. This ultimately led to the cancellation of the Legco meeting for the first time in its history. More recently, Leung has been involved in an appeal against a criminal conviction he received with two others in 2002 for unlawful assembly. Under Hong Kong law, organizers of a peaceful assembly must notify police a week before the event. Leung didn't follow the rules, but he has been defending himself in Hong Kong's Court of Final Appeal by maintaining that the current law is ambiguous and subject to abuse. Despite involving Hong Kong's core civil liberties as well as the city's most popular politician, the court case has barely raised a stir at the SCMP. The newspaper, owned by Robert Kuok, a Malaysian tycoon with businesses in China, has given the story scant coverage, adding to speculation that the local media is actively engaged in self-censorship. In her book "Self-Censorship and the Struggle for Press Freedom in Hong Kong," University of Hong Kong Law Professor Anne Cheung states that self-censorship, "a mechanism of anticipatory avoidance of sanctions" is "epidemic and endemic." Judith Clarke, an assistant professor in the Department of Journalism at Hong Kong Baptist University, has also noted "the great majority of the Hong Kong news media is in the hands of overtly pro-Beijing proprietors or businessmen whose interests in the mainland make content critical of the Chinese governments undesirable." Indeed, it's a peculiar sign of the times when a popular figure like Leung, who also happens to be a democratic activist, is ostracized as a radical. I decided to interview this Hong Kong enigma to find out what all the fuss is about. We met in his new constituency office on a Monday night in Tai Po, a working-class suburb in the New Territories about 45 minutes from the financial center of Hong Kong. It's the time when Leung meets with whoever drops in to petition him with queries and complaints for the government. When I arrived for our interview, Leung waved "Hello" to me and went back to his discussion. He was sitting behind a long table facing the room, smiling as he stood up to greet his constituents before shaking a hand and sitting back down. I took a seat and waited my turn behind the 13 or so people ahead of me. 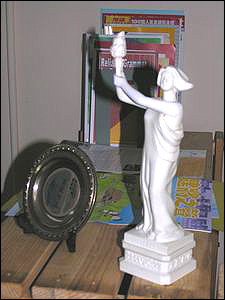 My eyes perused the office, noting a miniature statue of "The Goddess of Democracy," the symbol of the 1989 Tiananmen protests, sitting prominently on one shelf and a poster of the former Chief Executive with a pie in his face hanging on the wall. After a few discussions he excused himself and went to the back of the room, opened a small door and stepped outside. I followed to find him lighting up a cigarette on a back porch and chatting with some supporters. 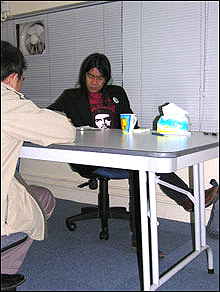 When I finally got my chance to sit down with him, Leung looked weary and a little bleary-eyed. He asked if we could do the interview in a car on the way to Hong Kong Island, but when I told him I live close by he just nodded and motioned for us to begin. In person he is a striking figure, standing about six feet in black jeans and a matching blazer over his ever-present talisman; a Che Guevara T-shirt. With long dark hair falling over his shoulders, he resembles a seamless mix of street grittiness and rebel chic. His appeal is casual and like a beatnik writer he exudes a hip intellectualism that has attracted many young voters. "I'm a justice maker, a law-maker," Leung countered when asked if he is a troublemaker. "I am not an honorable member, but a political member ... honorable doesn't really count, votes count," he continued. In many ways, Leung's childhood experiences paved the way for his life as a rebel politician. His mother and father split up when he was six. He remembers his mother being "exploited as a second class person" working as an ahma, or domestic helper. "The atmosphere of the '60s helped build my interest, the riots of '67, the Cultural Revolution, people suffering for their beliefs. I read a lot as a young man and became a Trotskyite at 18," he recalls, referring to the Communist-inspired riots that flared up against the British colonial government. I'm younger than that now"
Despite his iconoclastic image, Leung's ethos is fashioned in large part from the '60s hippie tradition. In conservatively coiffed Hong Kong, a man with long hair can still be seen as a radical. "No need to cut my hair, even if China apologizes for 1989," he says referring to the Tiananmen Square massacre. He explained that it was "very simple" to get elected with almost 62,000 votes in September's Legco elections after attempting and failing in 2000 with only 19,000 votes, 8000 short of the winner. "I knew I had a good chance to win with youngsters registered as new voters." The government's poor performance was also a factor. "During the past four years the government showed Hong Kong People no vision for the future, it tried to secure the profits of tycoons rather than the people...it failed to listen, failed to solve ordinary discontent and created political disarray." After his controversial start in Legco, adjusting hasn't posed any significant challenges. "There's no reason to adjust, the meetings are quite boring. Legco is a rubber stamp. There are a lot of snobbish things, it's like a tea house." As for his priorities, Leung fires off a list that includes "a referendum for universal suffrage, labor rights, social security, stopping the privatization of property and getting tycoons to contribute more percentage of wealth back to society." His flair for theatrics has involved interrupting government functions by delivering mock-coffins in commemoration of those who died in the Tiananmen Square massacre. He boasts of having the longest record of any legislator; criminal record, that is. University of Hong Kong Professor of Law, Albert Chen, believes "Beijing would not be willing to have a dialogue" with Leung. This is a potential obstacle. His intractable disdain for the government in Beijing could stifle any real opportunity for his influence to achieve results. His bitterness towards the central government comes through clearly when discussing Tiananmen. "Beijing needs reconciliation, a re-verdict and a full and open investigation. It's a massacre, I can never forgive the butchers. Honesty comes first. They can't say it was a foundation for modernization." In October 2004 while a trip to France, President Hu Jintao reiterated the Chinese government's official policy towards the massacre, saying, "The government took determined action to calm the political storm of 1989, and enabled China to enjoy stable development." There appears to be little chance of any reassessment in the near future. Michael DeGolyer, head of the Hong Kong Transition Project, believes Leung and others in the pan-democratic movement are "stuck in a June 4th mentality" by allowing the Tiananmen Square massacre to shade their relationship with Beijing. The implication is that Leung lacks the ability to champion anything beyond issues with an anti-Beijing agenda. Leung's refusal to kowtow also risks alienating potential allies and has prevented any dialogue with the powers that matter in Beijing. He has been passed over when Beijing issued invitations to other more moderate pro-democracy legislators to visit the Mainland. Nevertheless, he remains defiant. If he had his way he would "reconsider the entire Basic Law and try to make a better constitution for Hong Kong people and democracy." He believes the Basic Law was written by London and Beijing without input from Hong Kong. His more radical proposals and his willingness to confront Beijing set Leung apart from other Legco members and help explain his affinity for the Cuban revolutionary, Che Guevara. "Che was a man of action, integrity, dignity. He could give up something most people try to keep and kept challenging his own idea." Like Guevara, Leung has begun to travel beyond his place of birth to attend to political issues and reach out through other mediums of communication. 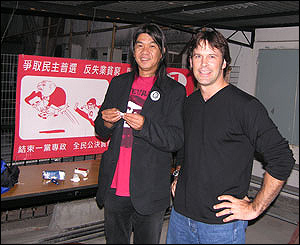 He was invited to speak at a forum on Hong Kong in Calgary, Canada, and in 2003 and he toured Cuba, Argentina and Bolivia with a local drama group, FM Theatre Power. "I went to Cuba, Argentina, Bolivia as part of drama writing. Cuba is declining -- very friendly people, but they don't need to go through poverty." While on the tour the group followed Guevara's path as related in his book, "The Motorcycle Diaries" to help prepare for the drama performance of "May Be Long Hair, May Be Che Guevara," staged last year. In December, a film version was released. When our talk turns to international issues, Leung said he believes the U.S. "will support the suppression of human rights," and that the invasion of Iraq has resulted in "more people becoming aware that globalization means war." For better or worse, Leung's appeal rests in large measure on his taste for theatrics and on a heavy dose of "star power." When asked who should be the next Chief Executive he responds that "anyone will do." Maybe not, but as he has proven, Leung has a flair for dramatic surprises.